A breakthrough serum that helps repair skin damage, activate skin's natural age resisting mechanisms and protect against environmental aggressors. 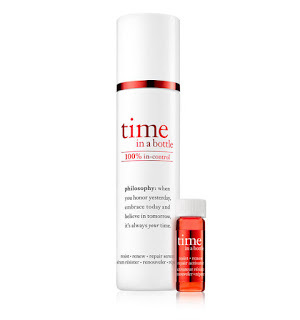 This serum works through the three dimensions of time: past, present and future, to reveal stronger, younger looking skin. Take control of the way your skin ages with our breakthrough serum that activates skin's natural age resistant mechanisms and protects against environmental aggressors. Reveal stronger, younger looking skin. Formulated with philosophy's unique age related technology to repair yesterday's visible signs of aging, help renew skin's defenses today and resist tomorrow's aging. Use Morning and or Evening after Cleansing. For first use, pour the entire vial of the high potency Vitamin C8 Activator into the serum, fasten pump and shake well for 20 seconds. The serum will turn light pink when ready to begin transforming your skin. Use within 3 months of mixing for best results. Why It Works: the exclusive liposome complex stimulates skin's natural repair function to repair skin at its source. Potent Vitamin C8 and an patented anti-oxidant neutralize damaging free radicals to help renew skin's protection from daily aggressors. Extracts from rare Himalayan red rice, red grape ferment and plantain leaf help reactivate skin's natural age resisting mechanisms, for results you can see and feel. Innovative fresh pour system for optimal potency of active ingredients. 88% of women showed significant improvement with texture, tone, lines and wrinkles*. 100% showed a dramatic improvement in firmness**. I was extremely happy with the results of time in a bottle. I noticed improvement in overall firmness, skin tone, fine lines and skin texture. When I mean skin tone, I mean hyperpigmentation. It evened out my skin tone, lightening up my skin's pigmentation issue. To me that was a huge result. And the best thing about this product is that it helps to prevent future aging too. This breakthrough eye serum helps repair skin damage, activates skin's natural age-resisting mechanisms, protect against environmental aggressors and achieve a more rested appearance. The high potency eye serum simultaneously acts on all dimensions of time to impact your skin's past, present and future. The exclusive liposome complex stimulates skin's natural repair function to repair skin at its source. Carnosine peptide, Vitamin C8 and a patented anti-oxidant complex neutralize damaging free radicals to help renew skin's protection from daily aggressors. Extracts from rare Himalayan red rice, red grape ferment and plantain leaf help reactivate skin's natural age resisting mechanisms. Ginkgo Extract and Caffeine help to achieve a more rested appearance, leaving the delicate eye area with results you can see and feel. Apply to eye area morning and evening. Why It Works: the exclusive liposome complex stimulates skin's natural repair function to repair skin at its source. Carnosine Peptide, Vitamin C8 and a natural anti-oxidant complex neutralize free radicals to help renew skin's protection from daily aggressors. Extracts from rare Himalayan red rice, red grape ferment and plantain leaf help reactivate skin's natural age resisting mechanisms, for results you can see and feel. Ginkgo Extract and Caffeine help achieve a more rested appearance, leaving the delicate eye area with results you can see and feel. 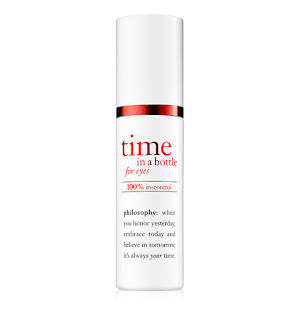 I found that time in a bottle for eyes definitely made my dark circles lighter, it made my eyes look more luminous and made my eyes firmer and tighter. It made my eyes look all around better and just more wonderful. This is the best eye serum I have ever used. 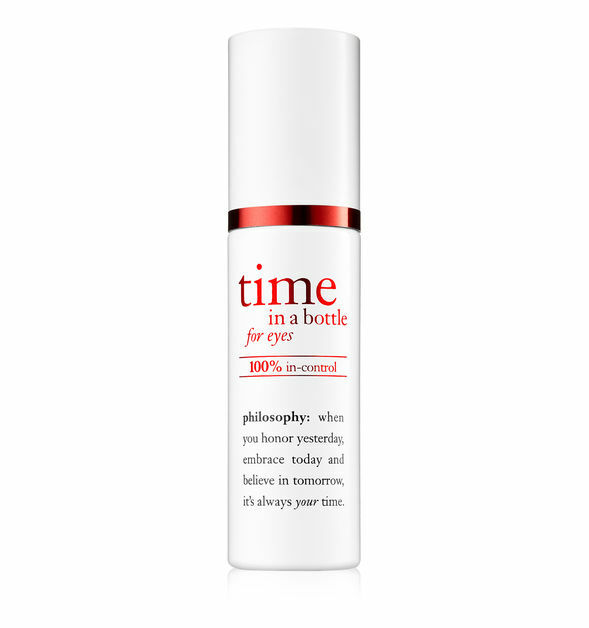 philosophy is available at www.philosophy.com, www.sephora.com, www.beauty.com, www.ulta.com and at SEPHORA and Ulta brick and mortar stores as well as at various department stores. Like philosophy on Facebook: https://www.facebook.com/philosophy; Follow philosophy on Twitter: @lovephilosophy; Follow philosophy on Pinterest: https://www.pinterest.com/lovephilosophy/; Follow philosophy on Instagram: https://www.instagram.com/lovephilosophy/ and Subscribe to philosophy on YouTube: https://www.youtube.com/philosophy.